As of this weekend-- Salmonella-tainted tomatoes have sickened more than 800 people in the food scandal that just keeps on giving. As I have written before, the inadequacies of the FDA will have a long range impact. In addition to the people who get sick, (some fatally) when these big-ag outbreaks happen, the absolute inability of the inadequately funded and grossly mismanaged FDA to track down the actually culprits and causes, ultimately effects all growers and particularly medium sized ones - leading to more big ag, more mismanagement and more health & safety concerns. It is a vicious circle. Growers urge salmonella hearings. Western Growers is urging the House Committee on Agriculture to quickly hold hearings on the salmonella outbreak associated with fresh, red round, roma and plum tomatoes. The industry group, whose membership includes produce growers in Monterey County, said federal food safety and health officials haven't been able to pinpoint the outbreak's source. 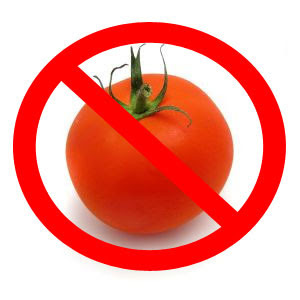 As a result, tomato growers are suffering great harm, the group said Saturday. The big companies can write this kind of thing off, pass on the expense, push a different product. The Medium size growers, canners, packers and shippers will go out of business which leaves us with less choice, more mono-culture, higher risk of poor health and safety standards. It will help small, local producers and that is the only good part of this story. Unfortunately small growers cannot grow enough to meet need and demand. We need some real house-cleaning in the FDA and almost every other federal oversight-bureau. It is going to take years to root out all the corruption and insider “looking the other way,” that is the legacy of this administration. In addition to making people sick, every major mistake like this will drive food prices higher. As with so many other Bush and Co. policies we are seeing the inevitable conclusions brought about by the GOP conservative, corporatist ideology. Here are just some highlights of the who's who in regulatory jobs under Bush-Cheney Inc.
DAVID LAURISKI, chosen as the Labor Department’s Assistant Secretary of Mine Safety and Health, previously spent 30 years in the mining industry, during which time he advocated loosening of coal dust standards. J. STEVEN GRILES, named Deputy Secretary of the Interior, was previously a lobbyist for major oil and mining companies and for the National Mining association. JACQUELINE GLASSMAN, appointed chief counsel of the National Highway Traffic Safety Administration, previously worked in the general counsel’s office of DaimlerChrysler, where among other things she helped defend against charges brought by California State officials that the company had recycled defective cars to consumers. Deputy Chief of Staff, Michael Torrey, had been a vice president at the International Dairy Foods Association. Deputy Secretary James Moseley was a partner in Infinity Pork LLC, a factory farm in Indiana. Under Secretary J.B. Penn had been an executive of Sparks Companies, an agribusiness consulting firm. Under Secretary Joseph Jen had been director of research at Campbell Soup Company’s Campbell Institute of Research and Technology. Under Secretary for Natural Resources and the Environment Mark Rey, whose post involved oversight of the Forest Service, was previously a vice president of the American Forest and Paper Association. Deputy Under Secretary Kate Coler had been director of government relations for the Food Marketing Institute. Assistant Secretary for Congressional Relations Mary Waters had been a senior director and legislative counsel for ConAgra Foods. I am sure none of these fine people were influenced by their prior corporate positions and none of them would put American citizens at risk in order to create larger profit margins for their former bosses. I am feeling pretty safe, how about you? *Update* from the thread (h/t ensley) there now seems to be some question if it even was the tomatoes which caused the outbreak. That's how poorly run the FDA really is.